TANEGASHIMA SPACE CENTER, Japan (JAXA PR) — At 2:52:27 a.m., September 23, 2018, Mitsubishi Heavy Industries, Ltd. (MHI) and Japan Aerospace Exploration Agency (JAXA) launched the H-IIB Launch Vehicle No. 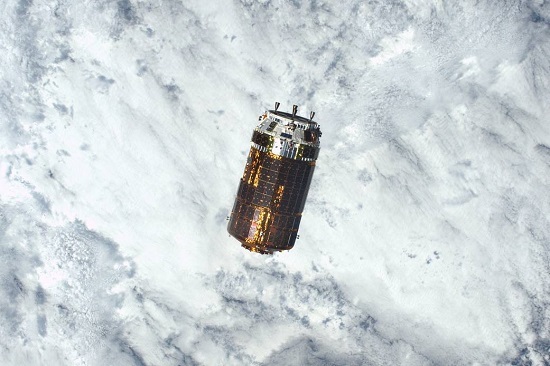 7 (H-IIB F7) which carries aboard the H-II Transfer Vehicle “KOUNOTORI7” (HTV7), the cargo transporter to the International Space Station (ISS), from the JAXA Tanegashima Space Center. 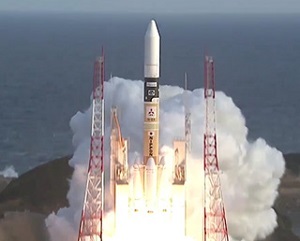 TOKYO (JAX PR) — Mitsubishi Heavy Industries, Ltd. and JAXA successfully launched H-IIA Launch Vehicle No. 37 (H-IIA F37) (with upgraded function) which encapsulates the Global Changing Observation Mission – Climate “SHIKISAI” (GCOM-C) and the Super Low Altitude Test Satellite “TSUBAME” (SLATS) at 10:26:22, 2017 (JST) from the JAXA Tanegashima Space Center. 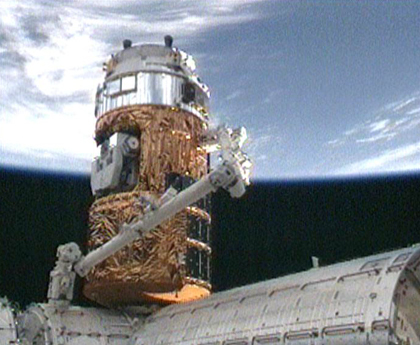 Approximately at 12:54 p.m. (Japan Standard Time, JST), the JAXA Santiago Ground Station, Chile received the signals from TSUBAME (SLATS; Super Low Altitude Satellite). The signal reception confirms that the satellite’s solar array deployment and attitude control based on the onboard sun sensors have occurred as scheduled. LONDON, 12 September 2017 (Inmarsat PR) — Inmarsat has selected Mitsubishi Heavy Industries (MHI) as the launch provider for the first satellite in the Inmarsat-6 fleet. The Nikkei Asian Review reports JAXA began test firings of the LE-9 rocket engine, which will power its new H-III launch vehicle. The first round of testing will include 11 firings through June. 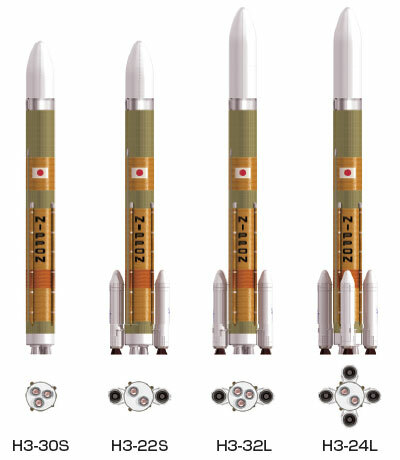 The new booster is set to replace the H-IIA and H-IIB launchers, which are the mainstay of Japan’s orbital rocket fleet. Mitsubishi Heavy Industries and IHI are leading the development of the new two-stage launch vehicle. H-III is designed to launch payloads at lower costs. The basic configuration can carry 4 metric tons into sun synchronous orbit. 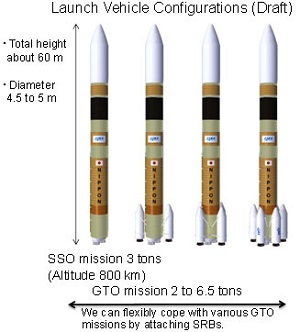 By adding two to four strap-on boosters to the first stage, H-III will be able to lift up to 6.5 metric tons into geostationary transfer orbit. The new booster will have a base cost of about 5 billion yen ($43.9 million). The H-IIA costs an estimated 10 billion yen ($87.8), with the more powerful H-IIB costing 10 billion yen ($131.5 million). JAXA’s goal is for the H-III to complete flight tests and enter service in March 2021. TOKYO & DUBAI, UAE (MHI/MBRSC PR)–Mitsubishi Heavy Industries, Ltd. (TOKYO:7011) (MHI) has received an order for H-IIA launch services from the Mohammed bin Rashid Space Centre (MBRSC), in the United Arab Emirates (UAE), for launch of the Emirates Mars Mission’s (EMM) Hope spacecraft. In order to better understand the Martian atmosphere and climate, Hope is expected to be launched in the summer of 2020 on MHI’s H-IIA launch vehicle, and is set to arrive at Mars in 2021 to coincide with the 50th anniversary of the founding of the UAE. This order for the EMM marks MHI’s fourth overseas contract for its launch services. TOKYO, March 12, 2015 (MHI PR) — Mitsubishi Heavy Industries, Ltd. (MHI) has conducted ground demonstration testing of “wireless power transmission,” a new technology presently under development to serve as the core technology of the space solar power systems (SSPS) that are expected to be the power generation systems of the future. With successful completion of the test at the company’s Kobe Shipyard & Machinery Works, MHI has now verified the viability of long-distance wireless power transmission. In the ground demonstration test, 10 kilowatts (kW) of power was sent from a transmitting unit by microwave. The reception of power was confirmed at a receiver unit located at a distance of 500 meters (m) away by the illumination of LED lights, using part of power transmitted. The transmission distance and power load mark new milestones in Japan with respect to length and volume of wireless power transmission. The testing also confirmed the performance of the advanced control system technology used to regulate the direction of the microwave beam so that it does not veer from the targeted receiver unit. TOKYO, March 9, 2015 (MHI PR) — Mitsubishi Heavy Industries, Ltd. (MHI) has received an order from the Emirates Institution for Advanced Science and Technology (EIAST), an organization established by the Dubai Government in the United Arab Emirates (UAE), for launch services for the KhalifaSat observation satellite. The KhalifaSat satellite will be launched in Japanese fiscal year 2017 (from late 2017 to early 2018) on MHI’s H-IIA launch vehicle together with GOSAT-2, a satellite tasked with observation of greenhouse gases, which Ministry of Environment, the Japan Aerospace Exploration Agency’s (JAXA) and National Institute of Environmental Studies are jointly developing. 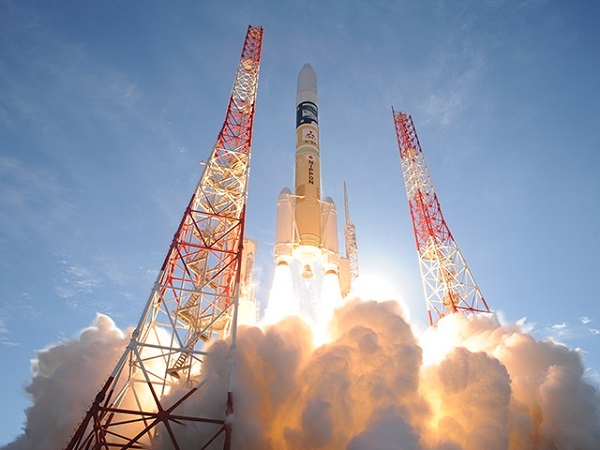 The new order for satellite launch services marks MHI’s third from outside Japan. Previously the company was selected by the Korea Aerospace Research Institute (KARI) to launch its Korea Multipurpose Satellite-3 (KOMPSAT-3), and was contracted by Telesat of Canada to launch its TELSTAR 12V communications and broadcasting satellite. TOKYO (JAXA PR) — The Japan Aerospace Exploration Agency (JAXA) made an announcement to the private sector on February 27, 2014, to compare their proposals and select a prime contractor who can be responsible for launch and space transportation services for a newly developed flagship launch vehicle. As a result, after carefully evaluated proposals including confirmation of application prerequisites and conformity with requirements, we have selected Mitsubishi Heavy Industries, Ltd. (MHI) as the prime contractor. JAXA will begin developing the new national flagship launch vehicle in early Japan Fiscal Year 2014 in cooperation with a group of private companies led by MHI. Mitsubishi Heavy Industries (MHI) – In part two of my report on NSRC-2012, I mentioned that a speaker from MHI had discussed results of biological tests performed on parabolic aircraft flights (Vol. 7, No. 5). He’d said that a suborbital reusable vehicle company was soon expected be engaged for research that included use of an animal experiment unit. 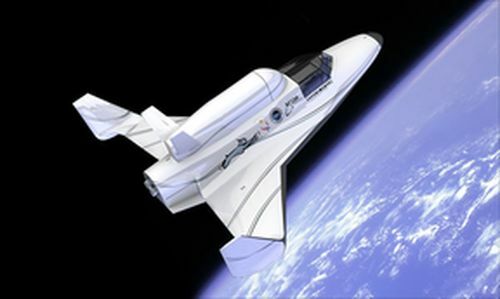 This year, XCOR was cited as that company. While MHI is has been engaged with biological experiments on the ISS, they want to take advantage of the low cost, high flight frequency and relatively low complexity of suborbital flight for new drug research. The experimental unit is in development to carry and provide full environmental support for up to ten mice. Its framework was shown during a fit check on the Lynx, where it would be located in the “Payload B” position, in place of the Lynx passenger seat. MHI plans to set up an animal life sciences lab in Midland, Texas, possibly in the same facility where XCOR will be establishing its new corporate and research headquarters. You can subscribe to The Lurio Report here. With today’s agreement, JAXA will procure launch and transportation services from MHI when a payload is launched by the H-IIB Launch Vehicle. 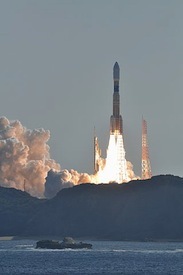 However, JAXA will continue to take responsibility of safety operations including overall safety confirmation, ground safety assurance, and flight safety and flight data acquisition in the same framework as when an H-IIA Launch Vehicle is launched. Through the privatization, we can expect to secure Japan’s international competitiveness both for the H-IIA and H-IIB by reducing costs, improving quality and energizing activities via efficient and swift management methods of the private sector. Meanwhile, JAXA would like to engage in enhancing reliability as well as maintaining and operating Japan’s launch facilities for Japan’s flagship launch vehicle series in order to provide reliable launch means to broader demands. Japan’s $155 million launch, scheduled for the southern Tanegashima spaceport in the wee hours of September 11, is intended to showcase the new rocket that JAXA and Mitsubishi Heavy Industries spent the last five years building. It’s also likely to inject a new dimension into Asia’s ongoing rocket race, the latest salvo of which was South Korea’s planned satellite launch this week. Seoul’s hopes were first decried by Pyongyang, which saw its own recent rocket launch meet with U.N. sanctions. But technical glitches scrubbed the South Korean launch. The Japan Aerospace Exploration Agency (JAXA) and Mitsubishi Heavy Industries, Ltd. postponed the first captive firing test (CFT) on March 27, 2009 (all times and dates are Japan Standard Time) at the Tanegashima Space Center due to an abnormal phenomenon in the coolant supply. Abnormal phenomenon: Coolant, which is supposed to pour and sprinkle for protecting the facilities and surrounding area when the launch vehicle engine is fired, did not pour and sprinkle.